"I think it's time to blow this scene. Get everybody and their stuff together. OK, 3, 2, 1, let's jam." Ah, the Seatbelts and their timeless song Tank! When I was younger I thought that it was an odd way to introduce an anime. Jazz? Loud rambunctious jazz instead of some nice and inviting J-pop or J-rock? Certainly a departure from the rest of a field even for 1998. However, despite being a bit of a musical oddity, the series gained a universal appeal because of its willingness to borrow from international pop culture. The likes of Alien, spaghetti westerns, Star Wars, and film noir are all tossed into this 26 episode anime. The names are in English on purpose and each episode has a bit of a different flavor. So there's something for everyone, I think. The first episode is called Asteroid Blues and it begins the series in a fairly somber fashion. Spike and Jet, being the bounty hunters that they are, travel the universe in search of a way to add some beef to their frequent meals of "peppers and beefless beef." Despite being a fairly dynamic duo with Jet being the brains and Spike being the daredevil, neither of them can seem to get things to go right. In the first episode their bounty is a guy by the name of Asimov Solensan and he sells (and religiously takes) a drug called Red Eye. Asimov is also travelling with the rather attractive femme fatale Katerina Solensan. She appears to be pregnant, but her belly is actually full of Red Eye vials. The two of them want to escape to Mars, but the police and the Bebop crew are on their tales. The Bebop crew naturally want to catch them first so they can get money from Asimov's bounty. Now I will spoil the first episode's ending and tell you what happens and if you don't want to know you don't have to. Just skip down a bit or stop reading until you've seen it. I won't mind. 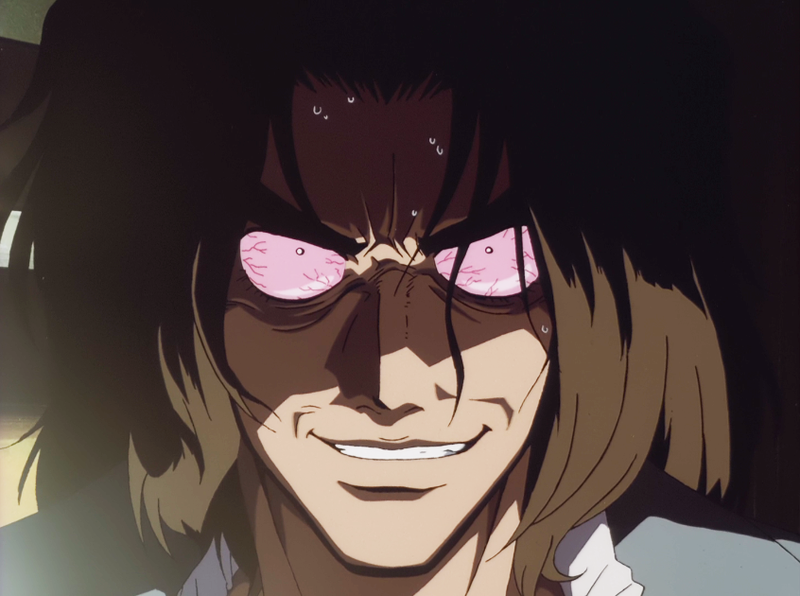 However, I believe most people that like anime have seen this series so I will commence with the spoilers now and come what may. Asimov and Katerina are trying to escape Spike in their spaceship, but they run into a barricade of police ships. Rather than be shot down or taken in, Katerina takes matters into her own hands and shoots her lost-to-addiction husband in the head before the police completely destroy their ship. Spike, unable to do anything else, watches as two people die pointlessly from the safety of his own ship. Not only do they die but Asimov's death obviously means no money for Spike and Jet. And, although you've got to believe Spike felt bad for Katerina and maybe even Asimov to a degree, you aren't sure just how bad he feels about that compared to losing the bounty. That bit of grayness and uncertainty is what makes Cowboy Bebop so damn good, though. Spike is the closest this series has to a good guy, but he's not the go-getter goody-goody like Luffy or Goku or any of the heroes from countless action anime. He screws up a lot and does a lot of reckless things without having any super powers to help him, but he somehow makes it through his ordeals. Not unscathed, though. Jet, on the other hand, is the sane man of the group. 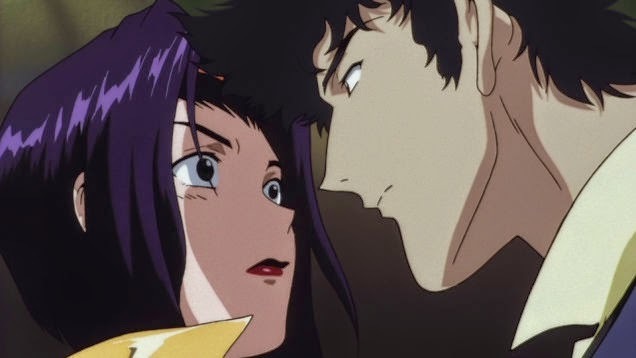 As a former member of the ISSP, the corrupt and illegitimate police force in the universe of Cowboy Bebop, Jet is a scarred man much like Spike and that seems to be why the two of them get along well enough. Of course, they know next to nothing about each other at the start. Spike doesn't know how Jet lost his arm and Jet doesn't know how Spike lost his eye. I don't think either of them knows at first that their previous jobs would have had Jet chasing after Spike. If that was explained I missed it despite having seen this series multiples times. In the second episode the super intelligent dog Ein gets introduced as a member of the Bebop and the damsel in debt Faye Valentine gets added to the crew officially in episode four, too. Although Faye gets introduced into the series in episode three. Faye is a lot of fun and she's also freakin' hot. A lot of the more upbeat episodes involve the hacker Edward Wong Hau Pepelu Tivrusky IV who gets introduced in episode nine. For brevity's sake everyone just calls her Edward or Radical Ed. She is the final member to join the Bebop crew and from then on the crew is set. All of the characters of the Bebop get their own special episodes or, in Spike's case, an arc that detail their lives before the Bebop. These episodes are especially fulfilling, but the ones about Spike take the cake. Spike's backstory begins with episode five Ballad of Fallen Angels and that's where we meet the series antagonist Vicious. You won't see him a lot because this series is largely episodic and episode six continues on like nothing major had happened in episode five, but he has a profound impact later on in the series with his few appearances. 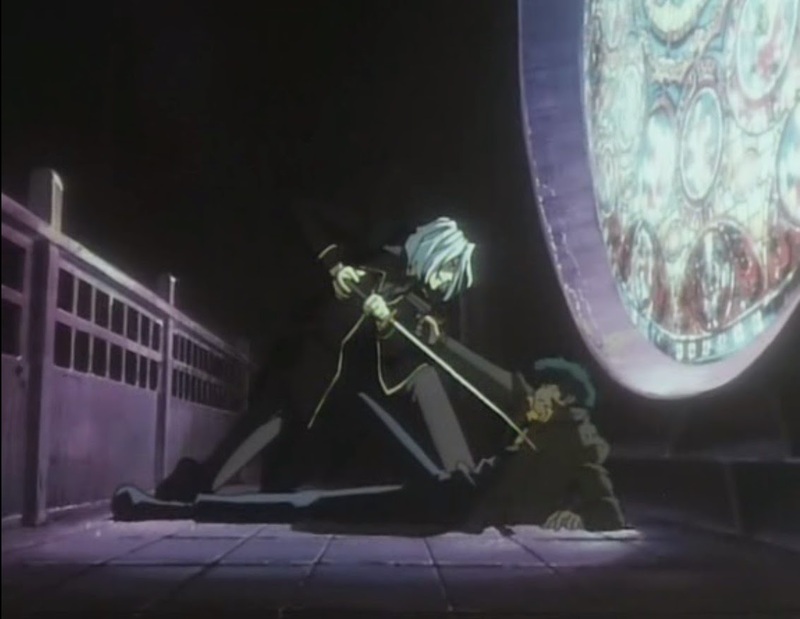 Vicious is definitely one of my favorite anime villains. Aside from the excellent bringing to life of even minor characters, the dialog in this series is incredibly sharp and the exchanges between characters is witty. Most lines are easily quotable and the English dub is very close to the Japanese meanings so nothing becomes too lost in translation. I watched the sub on blu-ray and at no point did I really hit my head and say, "The dub wasn't even close on that!" So a lot of the catchy lines come from the source material and that is a plus. One of those lines is in the first episode. "Yeah, keep those eyes open." Just a great line in a great situation. Vicious is nothing but good lines, too. The music is classic. The series is worth watching alone for the music. Especially if you have an appreciation for jazz. All of the tunes are originals and were made solely for this anime so each piece fits perfectly with each scene. A lot of thought was put into the anime as a whole and it deserves it reputation as one of the best anime out there. 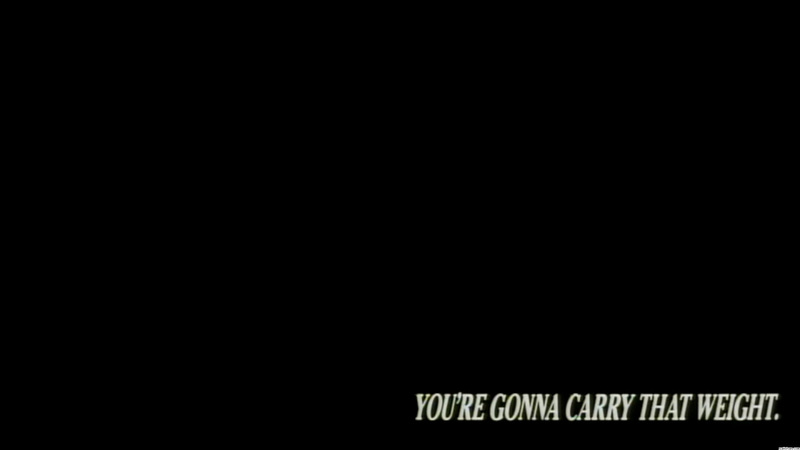 Even the ending messages just before the credits like "See you Space Cowboy" or Easy Come, Easy Go" are nice touches that make this anime feel more special than others that just want to blow you away with endless scenes of action. Each episode has meaning even if it seems like some of them have no obvious connection to the others. The message, in this case, is sometimes more important than any specific continuity. Although, as previously stated, continuity does play a big part as the series goes on. Cowboy Bebop is kind of like the On the Waterfront of anime. 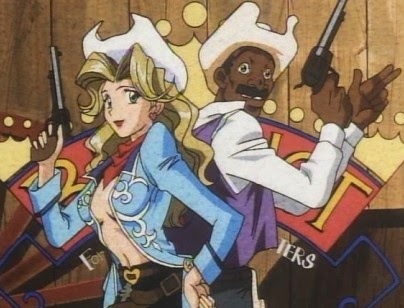 It's kind of become a stereotype to call Cowboy Bebop a classic because anyone into the genre at all hears it being called that all the time. It's the truth, though. They don't make them like this anymore.